LNP senator James McGrath has passed a motion calling for the Queensland government to look at culling crocodiles. ▶ Videos for "James Mcgrath"
Athlete Jacob Olivier jumped on a foilboard to give a woman he has had a crush on for a while, a flower. 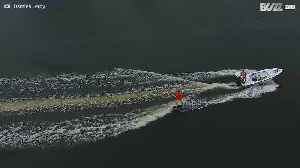 The boat driver is James McGrath and the video was created by Damien Leroy and Manuel Olivier. The Queenslander pledged to be a 'mozzie' in Malcolm Turnbull's ear, but he quickly fell out with the PM he was supposed to serve. The abstainers, for the record, were Michaelia Cash, David Fawcett, James McGrath, Zed Seselja, Bridget McKenzie, Deb O'Neill, Pauline Hanson and Peter Georgiou. Summer is here, Parliament has risen and no doubt our more bookish leaders will use the long break to catch up on their reading and expand their horizons. It's only now, with the release of expenditure.. It was senator James McGrath who acknowledged the inescapable truth early: everyone was obsessed with the US election. McGrath sales agent, James Ledgerwood, chats to Domain Prestige. PM’s assistant minister James McGrath denounces Hillary Clinton and Donald Trump as either incompetent or untrustworthy.